If you like to go hunting for sterling silver or silver-plated tableware, you already know that the items you find at antique stores and estate sales usually fall into these two categories . . . If you’re in a business that has given you a quantity of silver, platinum, or gold-containing items – like old cutlery, silverware, rings, watches – you definitely have precious metals that are worth refining. The problem is, it’s hard to understand just how much precious metal those items contain. And the more different items you have, the more confusing it becomes. Older silver-plate, for example, can contain larger quantities of silver than more modern plated flatware and tableware do. But how can you know how much silver is really in your silverware or whether it is worth recycling? Items of gold jewelry from other countries are often not stamped with standard karat numbers. Sometimes there are no numbers at all. What should you be looking for? Often, the only way to cut through the confusion is to send your items to a qualified precious metals refinery that can analyze them and tell you precisely what you have. Why not call Specialty Metals Smelters and Refiners at 800-426-2344 to talk things over? Even if you have a mixed collection of items, we can help you understand just what they are – and then help you get top dollar for the precious metals they contain. Did you just inherit a chest of silver or silver-plated tableware or a silver-plated tea service or punchbowl? If so, you could have something quite valuable on your hands. 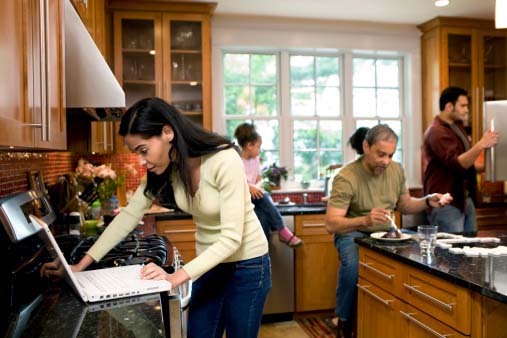 Silverware is different from other recyclables, because a lot of value can often be found in smaller quantities. If you want to recycle automotive catalytic converters for the platinum they contain, for example, you’ll need to have at least 500 of them before recycling becomes worthwhile. The same is true for gold-bearing printed circuit boards. Although they contain gold, only a large quantity of escrap will yield a significant amount of money. First, silverware is often collectible. If you want an example of just how much one chest of silver can be worth, take a look at this Victorian silver desert service made in 1848. It includes 12 dessert spoons, 12 dessert forks, and 12 dessert knives. They come displayed in their original wooden chest. The set is currently being offered for sale by M. S. Rau Antiques in New Orleans. The price? $19,850. Second, even small quantities of silverware can contain significant amounts of silver. If the set that you have is not valuable to collectors (consult a qualified appraiser to be sure), the silver alone can be worth a lot of money. Silver is currently trading at nearly $20/troy ounce on the London Fix. If you send a sample to Specialty Metals Smelters and Refiners to be tested, you could be in for a very pleasant surprise. Call us at 800-426-2344 to learn more. Did you just inherit a pair of silver salad serving spoons from your grandmother? Or did you just acquire a large quantity of older silver or silver-plated cutlery? No matter how few or how many silver items you own, you probably have a lot of questions on your mind. Yes, the pieces that you own are stamped with little markings on the underside of their handles. But what do they mean? How can you identify the company that made the items that you own? How can you tell whether they are pure silver or silver-plated? And most important of all, is your silver likely to be worth a lot of money or only a few dollars? If you’re asking questions like those, you need to know about 925-1000.com’s Online Encyclopedia of Silver Marks, Hallmarks, and Maker’s Marks, available for instant research online. It’s a vast online reference to silverware patterns, markings, manufacturers, and more. Best of all, it contains thousands of images of the markings that are stamped on the silverware items that you own. It may take a little time and digging to identify just what you have. But the good news is, you are almost certain to learn more about your holdings. 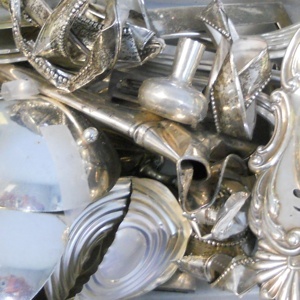 Here are some of the features of this remarkable online resource for owners of silver items. A library of images of marks and hallmarks and stampings from America, Great Britain, France, Italy, and many more countries. A database of manufacturing dates and critical information about silverware that was produced by the world’s most important manufacturers, including Tiffany, Lunt, and more. A collection of images of silverware patterns that helps you identify what you own. Links to dozens of online resources and books about silver. What Is Your Silverware and Silver-plated Tableware Worth? The Online Encyclopedia of Silver Marks, Hallmarks, and Maker’s Marks doesn’t list values for the pieces of silver tableware that it has catalogued. That’s a job for an appraiser who specializes in silverware. If you complete your research with an appraiser and determine that the real value of the items you own is contained in the silver that they contain, call Specialty Metals Smelters and Refiners at 800-426-2344. 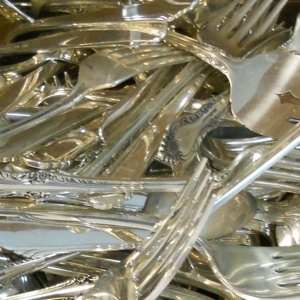 We’ll be happy to discuss your silverware with you and explain how we can help you realize the greatest return by letting us refine and recycle your silver and silver-plated items.